Musical Variety and Singing. 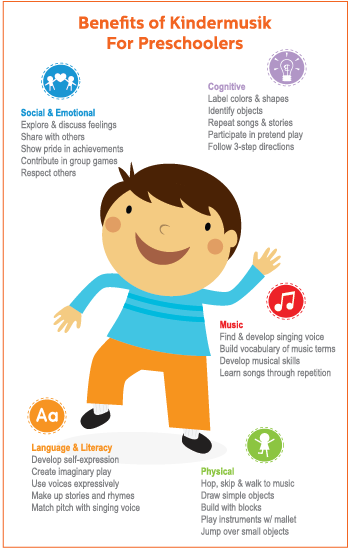 Activities include a mixture of musical genres and styles and provide a setting for your child to explore his many voices and to use a “singing voice.” Singing helps with memory and recall, physical development, creativity and socialisation. Note: Although our Kindermusik Imagine That class runs as a semester course, children may join into the program at any time. Fees are simply adjusted to include the remaining lessons in the unit. The cost for the unit is broken down into a lesson component, and a home materials component. The lesson component reduces as the semester progresses, however the home materials component does not reduce, as all students receive the same pack (CD, instrument, storybooks, activity book, playset) on joining the class. Cost: $199 for Term 2 only (9 lessons + materials). This unit uses weather as the basis for fun activities while making children more aware of the powers and beauty of the nature around them. Children and their families will be encouraged to get outdoors and enjoy the world around them – simply being together in all types of weather! They’ll create delightful home activity projects like making wind chimes, rain hats, sleigh bells and snow boots. Just as other units of Imagine That! feature pretend play concepts, so does Hello, Weather. Let’s play together. The beauty of imagination is that it allows children to cool off anytime… by pretending to play in the snow during the middle of summer… or by basking in the sunshine... or flying a kite in a spring breeze while the snow flies outside. – Imagine That! Each week provides preschoolers one uninterrupted session of imaginative play that's guided in a very specific, sequential way, with a special sharing time with parents in the last 15 minutes of class. Home Materials include: Two books [Michael Finnigan and Hurry Home Little Kittens], Two Home CD's, Hello Weather, Let's Play Together Play Set, a Family Activity Book, a Pair of Kindermusik Ankle Bells, and a Kindermusik Guiro/Shaker with Scraper. Children receive their home materials kit on their first lesson for the semester, with 2 storybooks handed out as the course progresses. Join a class at any point in the term, fees are adjusted on a pro-rata basis after the unit begins. Term 2, 2019 classes resume from Monday, April 29th, 2019. Flying Fox Studios has been proudly running Kindermusik in Everton Park since 2006 (and years before that based in Enoggera). Our studio has been designed with families and young children in mind. Our facilities include a parents kitchen, lounge room, backyard play area, internal bathroom, change table, high chair, microwave, and comfortable couches to feed bub on. We are a family with young children ourselves, and understand jugling the demands of young children can be tough sometimes! For this reason we offer a flexible make up class policy, and a friendly community minded atmosphere. A Kindermusik class is a wonderful opportunity to spend a concentrated 45 minutes playing / singing / dancing with your baby, without the distractions of the fast paced outside world. All children and parents are welcome to come along and join us. Please arrive early for your trial class. It can be very intimidating for children to join a new setting after the lesson has begun.